China is launching its first space laboratory module Tiangong 1 today (Sept. 29) on a critical test flight to demonstrate the vital docking technology required for a future space station. The Tiangong 1 space lab will serve as a space station module prototype for China, which is the third country (after Russia and the United States) to develop the capability to launch astronauts into space and return them safely to Earth. What is China's Tiangong 1? Why is the Tiangong 1 mission important for China? China has been taking a stepping stone approach to human spaceflight that began with the 2003 launch of Yang Liwei, China's first astronaut. In 2005, China launched its second human spaceflight, a two-person mission, in 2005. A three-person flight followed in 2008, a mission that included China's first spacewalk. The Tiangong 1 mission will mark China's first attempt to dock two spacecraft together, a vital skill that will be needed to build a large space station in orbit. This image depicts a full crew of three astronauts inside China's first space laboratory, the Tiangong 1. How large is the Tiangong 1 space lab? Tiangong 1 is a cylindrical spacecraft that is about 34 feet (10.4 meters) long and 11 feet (3.4 m) wide. The space laboratory weighs about 8.5 metric tons, or about 9.4 short tons (U.S.). 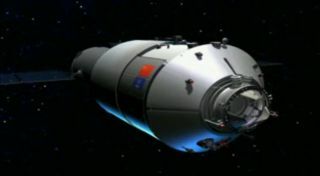 The Chinese space station prototype consists of two major segments: the experiment module and a resource module. The experiment module is the primary work and living area for visiting astronauts. It is powered by two solar arrays and serves as the docking point for arriving Shenzhou spacecraft. According to a mission overview video, the laboratory can be left unmanned or host visiting crews of up to three astronauts. The solar arrays are attached to the Tiangong 1 resource module, which also contains the propellant tanks and rocket engines for the spacecraft. China's Tiangong 1 spacecraft and Long March 2F rocket is pictured at the launch site after being transferred from a facility at the Jiuquan Satellite Launching Center. How will China launch Tiangong 1? China will use a special version of its Long March 2F rocket to launch the space laboratory. The rocket, called a Long March 2F T1, is a modified version of the booster China uses to launch its crewed Shenzhou spacecraft. It does not have a launch escape system (since Tiangong 1 is launching unmanned) and includes a custom fairing and an improved rocket booster structure in order to increase its lift capacity, Chinese space officials said. The Long March 2F T1 rocket is about 170 feet (52 meters) tall and can launch payloads of up to 8.6 metric tons into space. It weighs about 493 metric tons at liftoff. It will launch from the Jiuquan Satellite Launch Center in Northwest China. When will the first docking at Tiangong 1 occur? If that first mission is successful, at least two more flights (Shenzhou 9 and Shenzhou 10) are planned in 2012. The Shenzhou 10 mission may carry the first crew to the Tiangong 1, and may include China's first female astronaut, according to state media reports. A Chinese Shenzhou spacecraft closes in on the country's Tiangong 1 space lab in this still from a mission profile video. How high will the Tiangong 1 fly? The Tiangong 1 module will initially launch into a 217-mile (350-kilometer) orbit around Earth, which will require two maneuvers by the spacecraft after liftoff in order to reach the planned flight path. While in this orbit, the spacecraft will be put through several systems tests. If all goes well, the Tiangong 1 will be lowered to an orbit of about 213 miles (343 km) in order to meet the Shenzhou 8 spacecraft in November. At the end of that mission, the space lab will return to the higher orbit to await the next visiting Shenzhou spacecraft. Where is the Tiangong 1 space laboratory controlled from? The Tiangong 1 mission will be controlled by flight controllers at the Beijing Aerospace Flight Control Center, the Mission Control for China's human spaceflight program. China plans to dispose of the Tiangong 1 space laboratory by commanding it to burn up in Earth's atmosphere at the end of a two-year mission. How long can the Tiangong 1 spacecraft stay in space? Currently, China plans to keep the Tiangong 1 module in orbit for about two years, after which the spacecraft will be commanded to destroy itself by burning up in Earth's atmosphere, according to a mission profile video.